Why not come in contact with Kyoto's tradition? This is the most popular plan where you can make your original work (cup or bowl) using an electric potter's wheel in 40 to 60 minutes. The performance by the craftsmen is also really recommended. As a memory of your trip to Kyoto, as a present to your precious person, let's make a beautiful object that is unique in the world! 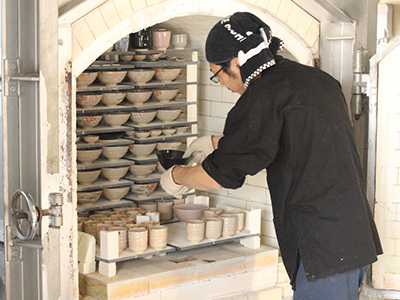 Learn from professional pottery artists in a pottery established in 1771. Craftsmen will gently support you, so beginners don’t need to worry. Make an item with a high state of completion which is thin and light. An object that is unique in the world, which also makes the perfect present. Close to all the super popular tourist spot in Kyoto, so you can experience this in between sightseeing. First lets start with watching an performance of the professional pottery artists! From just a lump of clay they can make a bowl in the blink of an eye, it is just like magic! Finally the pottery experience can start. You can make your favorite object with the preferred shape and size, such as a cup or bowl. You can shape your object by putting clay on the potter's wheel. The staff will kindly give you advice about your work and also take pictures, so even if you are a beginner you can enjoy this experience without worries. After this, while keeping your desired product in mind, choose your favorite color from the 5 types of glaze (colors) white, blue, black, yellow and pink. Our craftsmen finish up your work carefully by hand. 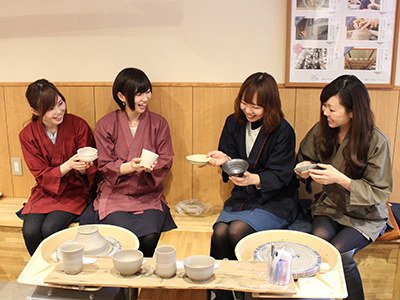 "Kiyomizu-yaki," a traditional craft, is known for its high quality and excellent design. To keep the quality high, the process of firing is essential. It takes about one month for your work to be delivered to you. You will see your work full of memories for the first time in a month. How do you like the finished work? Appreciating the warmth of the handiwork, we hope you will use it as your favorite for a long time. A 15-minutes walk from Kiyomizu-Gojo Station or Gion-Shijo Station on Keihan Line. Leave the exit number 4 of Kiyomizu-Goyo Station and go straight to the direction of Kiyomizu temple, around 650 meters. Turn left at the end of the street and walk straight ahead for 500 meters. When you turn right at the third traffic light of Yasaka Dori there is special narrow road where you can see the tower of Yasaka. Go to that direction and walk for around 200 meters. When you climb up the slope and go to your right at the end, you will see the sign of Zuikougama. Leave exit number 7 of Gion-Shijo Station and go straight to the direction of the Yasuka shrine, around 650 meters. Kiyomizu ware is one of the traditional products that represents Kyoto and it was originally called like this because of the pottery made in potteries in the Kiyomizu slope area towards the Kiyomizu Temple. When the tea ceremony became more popular in the 16th century various tea utensils and vessels were made in Kyoto and in the Edo Period (1603-1868) it was loved by the nobility and the samurai living in the capital. 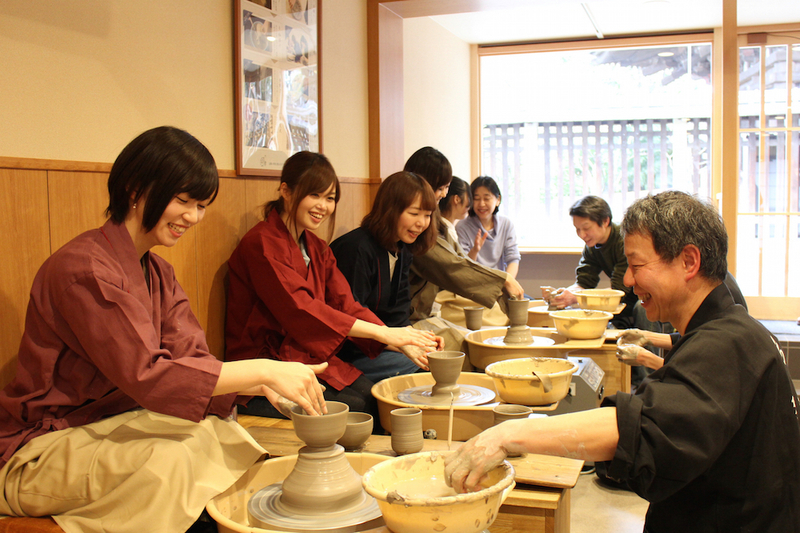 Kiyomizu ware is said to be very valuable because it is completely handmade. Kiyomizu Temple, famous for being a World Heritage Site is also famous for its sunset. A long time ago, it seems that training was held here to reach paradise, while keeping the round shape of the sun in mind. At dusk, the west gate and the three storied pagoda will light up in orange colors and you can look around the cityscape of Kyoto and the beautiful sunset setting beyond the mountain ridge. The figures of people in the popular spot Kiyomizu temple are sparse in the evening. After experiencing the ceramics of Kiyomizu ware, why not look at the spectacular sunset at Kiyomizu Temple?